You can add individual users who need access to PMF to your system, by adding a new owner record for each user. Owner records can be changed or deleted as needed. You can also import users from the WebFOCUS Managed Reporting/Centralized User Services (MR/CUS) environment directly into PMF as owners. In the Manage tab, click the Owners panel button. The New Owner panel opens, as shown in the following image. Specify values for all necessary fields. For more information about these fields, see Fields in the Owner Panels. Click Save when you have finished typing information into the appropriate fields. The tree refreshes to show the new owner. The following table lists and describes the fields in the New Owner and Edit Owner panels. Login ID for the user to enter on the logon page. Read-only in the Edit Owner panel (after a new owner record has been saved). First name for the owner. The maximum number of characters is 20. Last name for the owner. This is the field that appears in the tree by default. The maximum number of characters is 30. Used for alerts and other notifications. 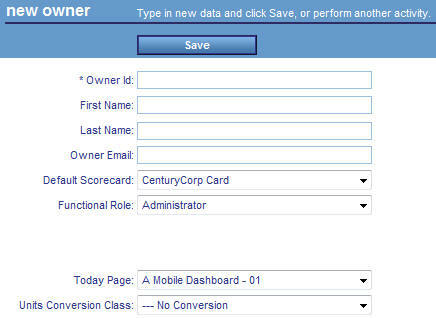 Select a scorecard that will serve as the default displayed on the owner Today tab. Roles determine system-level access to program functions for this owner. Select a default role value (Admin with Access Security, Administrator, Analyst, Author, Consumer, or Planner). You can also create new roles in the Functional Roles panel. For more information, see Working With Functional Roles. Select a default Today page. To change an existing owner record, navigate to the Owners tree and click the owner you want to change. The Edit Owner panel displays for that owner. Make the changes you want and click Save when you have finished. Note that the Last Name and First Name fields appear in the tree. If you edit these fields, click the Refresh content icon to see the updated name in the Owners tree. To delete an existing Owner record, navigate to the Owners tree and click the owner you want to delete. In the Edit Owner panel that opens, click the Delete button. PMF asks you to confirm your deletion. Note: If you are using a security system, the owner record will not lock the user out of other web systems you might be using. PMF will have no authorization for the user, and the user will not be able to access PMF data or views. To simplify coordinating PMF with your WebFOCUS installation, you can import users from the WebFOCUS Managed Reporting/Centralized User Services (MR/CUS) environment directly into PMF as owners. This gives you the ability to import all PMF-flagged users from your LDAP or Active Directory repositories, and easily integrate PMF with your single-source security environments. PMF can synchronize users between the WebFOCUS MR/CUS repository and the PMF Owners authorization table. If CUT is configured for Realm Driver, this capability enables PMF to import Owners from repositories, such as active directory and LDAP. Synchronizing users analyzes data in your user repository, compares users with PMF domain access to the list of current owners configured in PMF, and enables you to add all users at once, setting up the most necessary parameters for each. If a user has been authorized for PMF from any MR/CUS group that is enabled for the Performance Management Framework MRE Domain. If a user is already added to the system. If a user was added to the system but removed from the MR/CUS access. Optionally, you can set up new PMF users in the MR/CUS User Administration tool. Make sure each new user has been added to a standard PMF Group, such as Consumers, Analysts, or Administrators, or a custom PMF Group that has been granted primary access to the Performance Management Framework MRE Domain. PMF displays the Synchronize Users panel, as shown in the following image. Green plus sign. User is already a PMF Owner. Check box. User is enabled as a Managed Reporting user, has access to the Performance Management Framework MRE domain, but needs to be imported into PMF to become a PMF Owner, which is done by selecting the check box next to that user. Red minus Sign. User is in the Owners table, but needs to have access setup in the Performance Management Framework MRE domain. Note: The Synchronize Users panel can also be used to check the health and status of your basic authorization security in PMF. You can specify a different default Scorecard for each user by selecting the desired scorecard from the Scorecard drop-down menu. Select the check boxes for each user you want to import. For each selected check box, select a value in the Role drop-down menu or use the default role already displayed. Note: By default, PMF uses the current primary Group in the user repository to display the (Functional) Role for each user. Click Synchronize to synchronize the two systems.